It is often at this point that collaborations lose momentum. In the absence of constructive or productive exchange, working relationships stagnate and people retreat to the places where they feel safest: their own disciplines, their offices, or the colleagues who are on their ‘side’. As a consequence, prospects for meaningful collaboration and integration dwindle. We are a small group of PhD and early-career researchers involved in transdisciplinary research who have come together to share reflections, insights and strategies for the challenges we experience in our research. We will be hosting an informal networking day (5 February 2019, starting at 9AM) for PhD and early-career researchers involved in transdisciplinary (TD) research as a pre-conference event associated with the Leverage Points Conference to be held at Leuphana University in Lüneburg, Germany (6-8 February 2019). We recognise that many young scholars are already involved in numerous other networks, and do not intend this day to be the beginning of yet another formalised, structured network. We would rather just create a generative and enjoyable space for people to build interpersonal relationships and share their TD experiences with one another in a creative and meaningful way. We further see the value of pre-conference engagement in that it speaks directly to a core theme of the conference, namely transformative research practices. The intention of this workshop is to connect with researchers about this theme in a way that provides the basis for enhanced engagement on the topic during the course of the formal conference programme. Guiding thematic question: The following overarching question will be used to guide interactions on the day, and we will link this to our formal session in the conference programme where we will discuss this question in more detail: Practicing transdisciplinary research in a complex world: How can we as early-career TD researchers navigate the triple jump challenge of scientific rigour and excellence, societal relevance and engagement, and self-respect and care? We encourage people interested in participating in this networking day to read our blog seriesin which we introduce and reflect on this ‘triple jump challenge’ experienced by TD scholars. Process design: We propose using ‘Theory U’ as a process design tool (one of the methods we can share through practice in the day) to hold the activities of the day together, and also as some of the specific tools and activities (there is a suite of associated facilitation tools available on the Theory U website). We will also draw on other methods, and aim to make this a multi-sensory experience for participants. In this way we hope to create an experience where we not only reflect intellectually on our work, but also spend time re-connecting in and with nature, open our hearts, and let our creativity come to the fore! The methods we use are ones which participants could also use in stakeholder engagement and knowledge co-production processes in their own TD work. Participants: We will already be approximately 12 participants and would like to invite up to 18 additional early-careers scholars from the Leverage Points Conference to join us for the day. We will be capping the numbers at 30 participants to enable meaningful interactions and keep logistics manageable. We plan to circulate an open invite through our networks to join us for selected sessions via webinars. If you would like to join us in “making new connections for transformations” on this networking day, please send a brief biography and letter of motivation (maximum of 300 words) to David Lam by the 30th September 2018 (lam@leuphana.de). Participation in the workshop is free for early-career researchers attending the Leverage Points 2019 conference (excluding drinks, food, lunch, dinner, transport). If you wish to attend the workshop, but not the conference, please note this in your motivational letter. Facilitation: The day’s activities will be facilitated by our small group of international TD researchers the ‘TD PhD Journeys’ team, in partnership with PhDs and ECRs involved in TD research at Leuphana University. 1Institute for Ethics and Transdisciplinary Sustainability Research, Leuphana University, Lüneburg; 2Stockholm Resilience Centre, Stockholm University, Sweden; 3Environmental Learning Research Centre, Rhodes University, South Africa; 4Plant Conservation Unit and the African Climate and Development Initiative, University of Cape Town, South Africa; 5Centre for Complex Systems in Transition, Stellenbosch University, South Africa. One stream of the Leverage Points 2019 Conference addresses the transformation of research towards transformative research. Under the label of transformative research, various forms of research are currently being tested that pursue both epistemic and transformative goals. Such research should not only produce knowledge that can be applied—following the traditional knowledge transfer logic of academia—but also trigger or even induce transformation. Many scientists report from exciting experiences when engaging with the situation they research, but face difficulties, for example, when it comes to legitimizing interventions (“this is not your responsibility”); in publishing research results that have been created via action (“this is not a valid analysis”) and when stepping back and asking oneself: “What makes my professional identity? How to deal with my feelings of responsibility, and passion as a scientist? What does this do to my academic practice?” These dilemmas are not new. The question of whether homo politicushas to wait outside the door when entering academia is as old as modern scientific institutions. For sustainability science as a normative science, it is a crucial one to clarify. The fact that transformative research is on the rise opens up profound questions about roles, tasks, and last but not least, power relations in the social fabric (“Who can speak out loudly? Whose voice is heard, whose knowledge is accepted?” (Spivak 2007)). In doing so, the praxis of research is brought into view and methodological questions appear in a different light. As a consequence, the established legitimation mechanisms and quality criteria of knowledge generation are challenged, and negotiations of roles and tasks associated with transformative research become increasingly important. It is obvious that this does not happen without contradictions. Therefore, we should advance both, varied, unconventional and bold experiments that unbound the concept of research in approaching unsustainable situations, and thorough reflection to contribute to the theoretical consolidation of transformative research. It seems promising to do both at once. The Leverage Points 2019 Conference wants to create a space where encounters between more action oriented and more conceptual minded persons can take place. Where academic researchers, artistic researchers, every-day-life-researchers; spectators, interveners, administrators and inhabitants create dialogue and where dialogue becomes a lever to gain more profound understanding on how to realize transformative research, and ultimately, to transform the world into a more sustainable place. Because “[…] dialogue is the encounter in which the united reflection and action of the dialoguers are addressed to the world which is to be transformed […] (Paulo Freire, 1996 ). This is the third post in the series on ‘Transdisciplinary PhD Journeys’. My name is Jessica Cockburn. I recently completed my PhD in Environmental Science at Rhodes University (Grahamstown, South Africa). I am now a Postdoctoral Fellow at the Environmental Learning Research Centre. My PhD research was a transdisciplinary enquiry on stewardship and collaboration in multifunctional landscapes. Taking a transdisciplinary (TD) research approach in my PhD was a means for me to legitimise a personal commitment to conducting research that is relevant and of value to practitioners working on environmental stewardship in South Africa. It was a way for me to do ‘science with society’1. Looking at my mailbox crowded with invitations to conferences, workshops and symposia that pile up every day, it is hard to escape the notion that we drown in distractions. Hence, it is worth asking how we can focus our time and resources to bring us closer to our goal of urgently needed fundamental sustainability transformations? Is another conference the right way to do so? We see seemingly little change to many unsustainable trajectories in human-environment systems, despite a multitude of research and policy activities addressing these challenges. For many sustainability focused researchers and practitioners this can be deeply frustrating. To counter this frustration, about four years ago some colleagues and I re-discovered the metaphor of “Leverage Points to intervene in systems” by Donella Meadows (Meadows, 1999). Inspired by this work we have embarked on a research journey to investigate these “places in complex systems where a small shift may lead to fundamental changes in the system as a whole“ (Abson et al, 2017). Learning from many ups and downs during this journey, our initial sense has solidified that the notion of “Leverage Points” can serve as a boundary concept to help connect often disconnected scientific as well real world endeavors implicitly or explicitly aiming to contribute to sustainability transformations. Such an approach focuses on more fundamental, but often neglected, intervention points and system interventions; and in so doing enables research, discourse and action that have the potential to make a real difference. This inspiration and experience has motivated us to launch a conference that seeks to create new spaces to explore together, with a broad community of scholars from different backgrounds how the Leverage Points metaphor can help to “transform ourselves, our science, our institutions, our interventions and our societies for a better future”. In doing so, we want to offer and connect different formats, including presentations; discussions; interactive plenary sessions; case based mutual learning sessions and joint activities to explore leverage points, sustainability and transformational change. The conference will focus on five main themes (i.e. re-structuring institutions, re-connecting people, re-thinking knowledge, systems thinking, and transformative research practice). Each of these themes has its own community and in this conference, we will seek inspiration by drawing connections between these diverse communities. Similarly, the notion of leverage points itself can function as a metaphor, a research approach, a mindset or a concrete research object here to we seek inspiration from multiple perspectives (including from our inspirational key note speakers) in order to enrich and encourage science and practice that helps facilitate the transformative change we wish to see in the world. With this wide yet focused spirit I am convinced that #leverage2019 (http://leveragepoints2019.leuphana.de/) will not be just another conference but a vibrant, inspiring and meaningful experience that will trigger new lines of thinking and change in science and society, as well as the interaction between these two. I hope very much to see you 6-8 February 2109 in Lüneburg, Germany. The Call for Abstracts is open until 30 June 2018. Feel free to distribute the conference flyer, available as a PDF here. Abson, D.J., Fischer, J., Leventon, J., Newig, J., Schomerus, T., Vilsmaier, U., von Wehrden, H., Abernethy, P., Ives, C.D., Jager, N.W. and Lang, D.J., 2017. Leverage points for sustainability transformation. Ambio, 46(1), pp.30-39. Meadows, D., 1999. Leverage points. Places to Intervene in a System. The dissemination of results is a fundamental aspect of transdisciplinary research. That also holds true for the transdisciplinary projects of the master of sustainability science at Leuphana. Two groups of the transdisciplinary master project “Case Study Oldenburg” presented their results on 11 and 12 April in Hatten and Bassum in the Nature Park Wildeshauser Geest (NPWG). Both presentations were part of a meeting by representatives of the administration of the NPWG as well as mayors and tourism representatives of the municipalities. The administration of the NPWG is working on a plan for the development of the nature park in the comming 10 years. The aim of the student’s presentation was to discuss the results of the transdisciplinary research and possible recommendations for the development of the NPWG. The first presentation was focusing on the self-understanding of the association of the NPWG. The municipalities as members of the nature park association have quite different understandings about the purpose and goals of the nature park. They are ranging from tourism to nature protection as a major task. A challenge for the future will be to develop a joint understanding of the tasks and goals of the NPWG. The second presentation was about the role of sustainable tourism for a sustainable regional development within the NPWG. The results show that there is no shared understanding of tourism in the nature park. By developing a joint understanding of sustainable tourism and by strengthening the knowledge exchange and collaboration between the administration of the NPWG, the municipalities and tourism providers can contribute to a more sustainable regional development. Afterwards, two representatives from the administration of the NPWG highlighted the recent status of the NPWG with regard to the federal guidelines and explained the further process of the development of an updated plan for the nature park. The transdisciplinary master project was able to provide valuable studies for the further process and important impulses for the discussions. Especially the perspective of the students as “outsiders” was highly appreciated. The transdisciplinary master projects are running for two semesters. The overall aim is to experience a transdisciplinary process from the definition of a research question and the development of relationships with cooperation partners to the presentation of results. The mentioned transdisciplinary master students project is following up on the guiding question of how nature parks can be potential leverage points for a sustainability transformation in the region of Oldenburg. The results show that nature parks can contribute to a sustainable regional development with regard to sustainable tourism and the identification of actors with the nature park. However, they are based on a quite broad definition in the Nature Conservation Act in Lower Saxony. Furthermore, they are implemented in very different ways in Germany. Nature parks can play an important role as facilitators and organizers within regions that can bring interests and actors together. 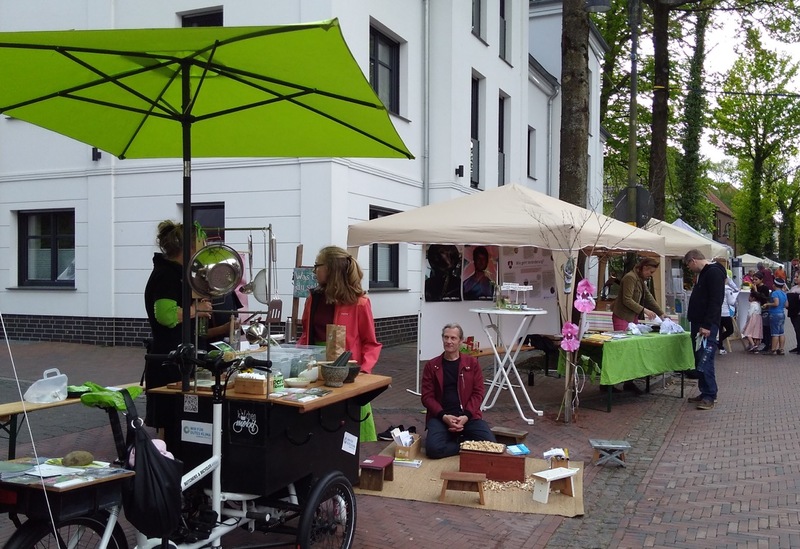 The next event within the transdisciplinary case study in the district of Oldenburg will be the Climate Fair in Wildeshausen on the 29 April. The Leverage Points project will be present with a stand together with the artecology_network. 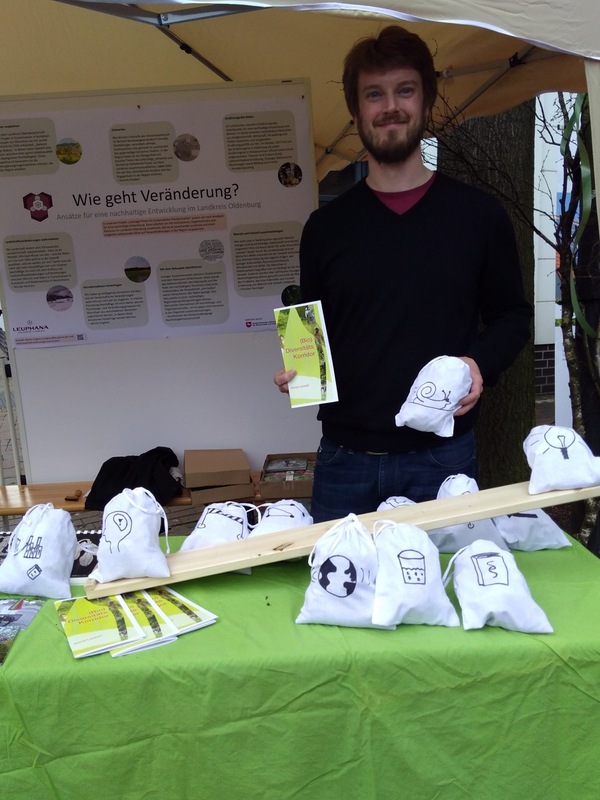 The Climate Fair is part of the Spargelfest in Wildeshausen as an important regional event in the capital city of the Oldenburg district.